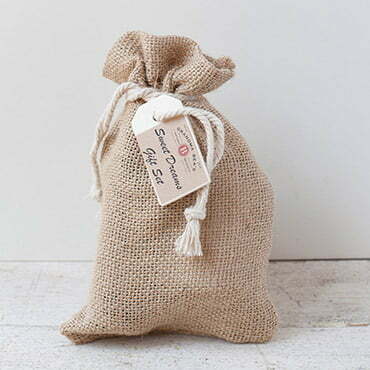 This little burlap bag is packed full of soothing goodies to help promote a good night's sleep. From calming bath melts to relaxing lotion and bedtime mist, they're made with a comforting blend of essential oils and natural ingredients to help you get some much needed rest. Sweet Dreams Bedtime Mist: Water, tangerine, orange, ylang ylang, patchouli and blue tansy essential oils. Sweet Dreams Bath Melts: Baking soda, corn starch, citric acid, Epsom salt, coconut oil, water, essential oil. Sweet Dreams Essential Oil Blend: Ylang ylang essential oil, canarium luzonicum gum nonvolatiles, chamomile oil, sweet orange oil, canarium luzonicum gum nonvolatiles, chamomilla recutita oil, tangerine oil, patchouli oil, tansy oil.